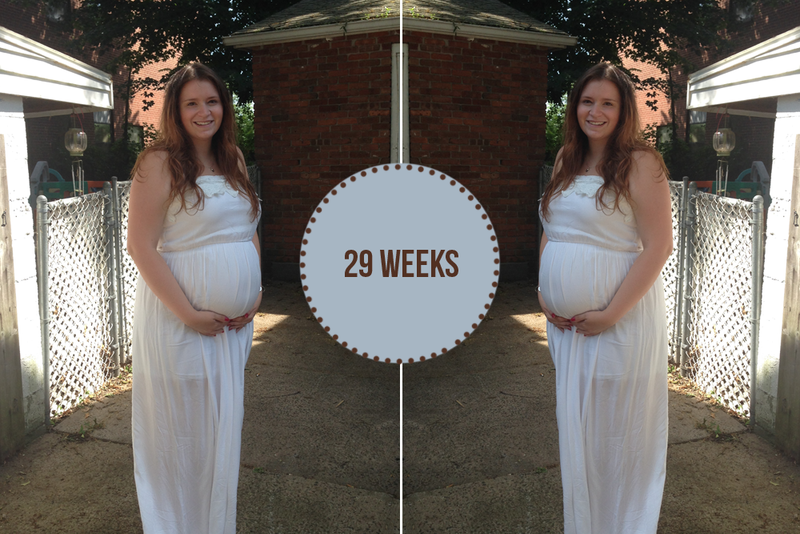 Baby Update | 29 Weeks! Well, technically 29 weeks and 3 days, but who's counting? (Me. I am.) Friday, I had my glucose test which really wasn't that bad. Like, at all. I'm not sure if that's a good thing or a bad thing. It basically tasted like flat soda but wasn't extra sweet or anything. I also had to hand in part two of my preeclampsia base test (a jug full of my urine - no joke). How far along? 29 weeks | 3 days. Total weight gain: 22 pounds. Maternity clothes? YES. And maxi dresses. Stretch marks? Yup. Around my belly button. Sleep: It really just depends on the night lately. The dogs have been all up on me which makes it hard to get comfortable and sometimes my back hurts in certain positions but I honestly can't complain. For the most part, sleep is still there. Miss Anything? Bananas. Random but I stopped eating them after getting horrible indigestion not once but TWICE from them. Worst feeling ever. Movement: Lots although he doesn't really have a schedule. Sometimes he moves like crazy, other times it's little to nothing. Food cravings: Definitely iced coffees, french fries. That's about it though. Anything making you queasy or sick: Nothing although if I eat too much, I start to feel nauseous. Symptoms: Back pain, getting pretty tired doing little things. Belly Button in or out? In. Wedding rings on or off? On but I noticed they're getting a little snug. Looking forward to: 4th of July, our baby shower coming up on the 13th, the birth of Anthony's sister's baby in July! Falling Forward Nail Art Challenge - Day Six: Fall Ombre/Gradient!